There is nothing better than a great big juicy prime rib roast dinner during the holiday season. While some people prefer a turkey Christmas dinner, my family and I love us some meat. The crispy exterior coupled with the tender juicy meat just makes our family time even more enriched. Get prime grade meat: Don’t cut corners! 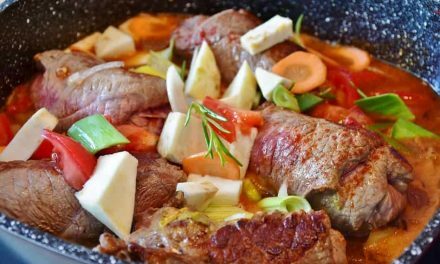 No guesswork: Invest in a digital meat thermometer to check when the interior of your roast reaches 120 degrees Fahrenheit in the oven and 130 degrees Fahrenheit after resting. Don’t rush it: If the recipe calls for the meat to be refrigerated overnight, do it! You can’t rush perfection. If you don’t already own a roasting pan, or are looking for a replacement, here are my top picks for the best pan for a prime rib roast. Calphalon is a trusted name when it comes to cookware and you can be sure every item on their product list is of top-notch quality. The Calphalon roasting pan is no different. It consists of a heavy-gauge aluminum core sandwiched between two layers of stainless-steel. The stainless-steel gives it extreme durability whereas the aluminum core gives it the advantage of quick and even heat up, eliminating hot spots and making sure the exterior of your prime rib roast is crisp and delicious. 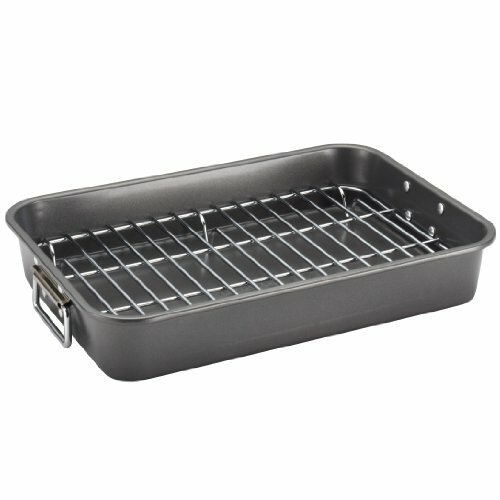 The stainless-steel surface is non-reactive and unlike non-stick roasting pans, is safe to use with all kinds of utensils. The pan comes with a roasting rack that can hold up to a 25-pound piece of meat. The triple-riveted handles make lifting and turning easy giving you complete control over the cooking process. 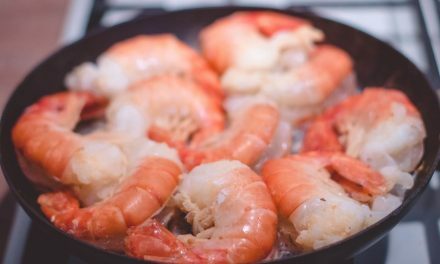 You can easily shift it from the oven to the stove and turn those delicious juices from your prime rib into a great tasting gravy. The non-stick v-rack lets heat circulate evenly across the piece of meat making sure every part of the outer surface of the meat is browned evenly. The roasting pan comes with stainless-steel handles that make it easy to lift it even with a heavy piece of meat in there. 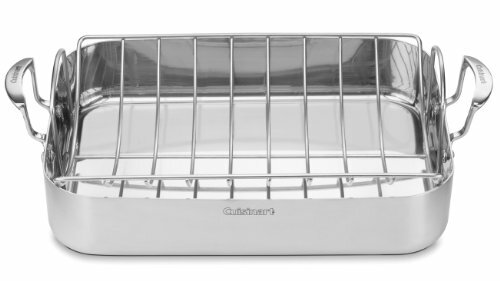 The roasting pan is safe to clean in the dishwasher and comes with Calphalon’s full lifetime warranty. This 16-inch roasting pan by Cuisinart comes in a sleek silver color and has a solid stainless-steel rack insert with it to allow even circulation of heat across your prime rib roast. 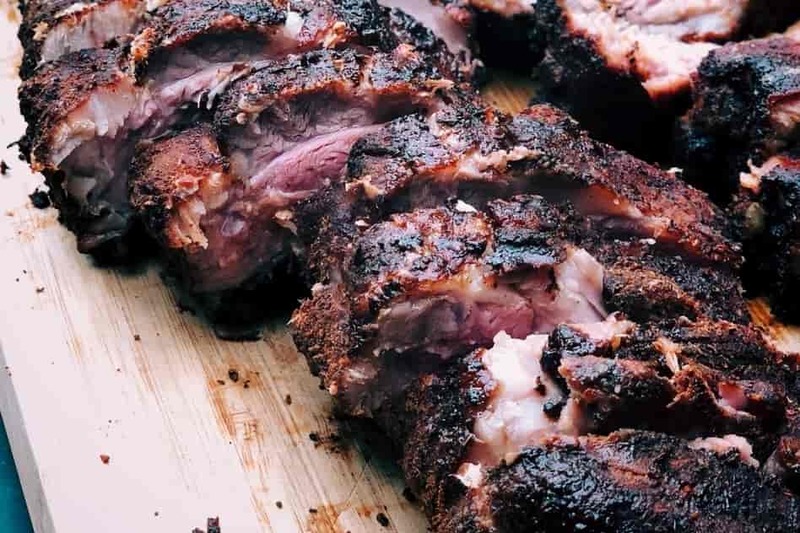 It lets the juices from the prime rib drip into the pan and helps achieve that crispy exterior. 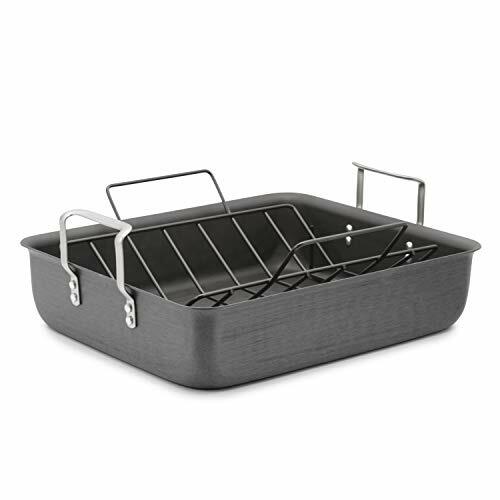 The stainless-steel triple ply construction means that this roasting pan is embedded with an aluminum core that helps heat transfer be more even and reduces cooking time as well. 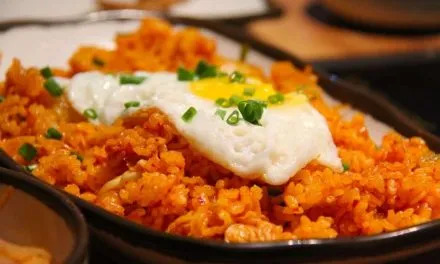 It can easily hold a hefty piece of prime rib or Turkey if you ever decide to switch things up. The stainless-steel riveted handles make placing the roast into the oven and lifting it out safe and hassle-free. 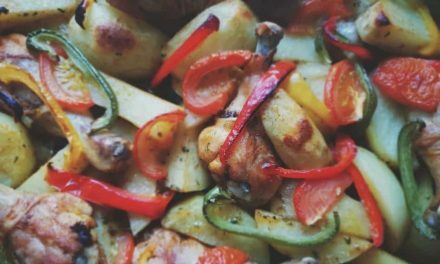 The great thing about this roasting pan is that it is suitable to use on an induction stovetop and can be safely used in the oven as well as the dishwasher. It comes with a limited lifetime warranty from the manufacturer. Another great option from Calphalon, this durable hard-anodized aluminum roasting pan allows you to sear, brown, caramelize and deglaze with ease. This 16-inch by 13-inch roasting pan provides superior conductivity and durability to ensure that you enjoy your prime rib roast for many Christmases to come. The V-shaped rack allows even heat distribution across the prime rib roast and gives you even browning on the surface. Moreover, the hard-anodized aluminum surface is perfect for deglazing sauces and will let you whip up the best gravy to go along with your perfect prime rib roast. Besides making a killer roast, you can also use it as a lasagna or casserole pan with great results. 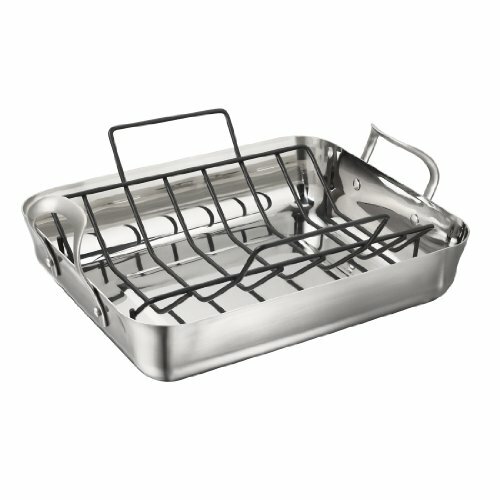 You can use this roasting pan on a gas, electric, halogen or glass stovetop and it is safe to use in the oven when exposed to temperatures under 450 degrees Fahrenheit. The loop handles are made of stainless steel which allows you to easily transfer the pan from the oven to the stovetop to make the jus to go along with your prime rib roast. This rectangular 11-inch by 15-inch roasting pan by Faberware is a great option for making a Prime Rib Roast. It comes with a flat rack and has a non-stick surface inside and out which makes cleaning and food release extremely quick and easy. The elevated flat rack lets the juices drain from the roast as it cooks, allowing you to store that delicious goodness for your gravy and the roast to crisp up properly. 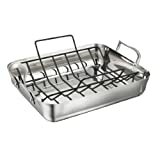 The chrome plated handles make it convenient to transfer from the oven to the countertop or stove. The heavy gauge carbon steel construction resists warping and can withstand a temperature of up to 450 degrees Fahrenheit in the oven. 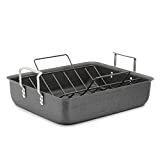 The flat rack makes it a versatile roasting pan, allowing you to not just roast heavy pieces of meat like a prime rib or a Turkey but also regular everyday meals like roasted vegetables or baked fish. Although all of these are great pans for a prime rib roast, my favorite pick of them all is the Calphalon Stainless-Steel Roasting Pan. Whichever pan you end up choosing, be sure to let me know how your experience with it went! Premium and Budget Cookware sets we love!